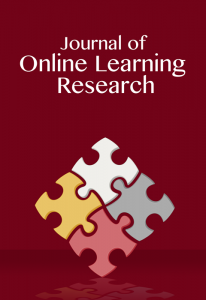 The Journal of Online Learning Research (JOLR) is a peer-reviewed journal devoted to the theoretical, empirical, and pragmatic understanding of technologies and their impact on pedagogy and policy in primary and secondary (K-12) online and blended environments. JOLR is Open Access, free-of-charge and distributed by the LearnTechLib-The Learning and Technology Library. It is the official journal of the Association for the Advancement of Computing in Education (AACE). All have free, online access to all back issues via LearnTechLib–The Learning & Technology Library. Address online learning, catering particularly to the educators who research, practice, design, and/or administer in primary and secondary schooling in online settings. However, the journal also serves those educators who have chosen to blend online learning tools and strategies in their face-to-face classroom. Include qualitative, quantitative, and mixed methods research from multiple fields and disciplines that have a shared goal of improving primary and secondary education worldwide. Be both theoretical and practical. Each research article is critically-reviewed to ensure publication of rigorous and thoughtful research. However, each publication must also contain pragmatic implications for research, policy, and practice. Since its creation in 2014, The Journal of Online Learning Research has had a commitment to being an international journal. As part of its mission, the journal seeks to have a lasting impact on education in primary and secondary (K-12) online and blended environments. To that end, and to cultivate a more global presence, we have created a special section of JOLR that will feature work done in international contexts that fits the scope and sequence of the journal. The international section will seek to feature scholarship that has been conducted in an international setting and/or features participants from international contexts. In addition, we seek manuscripts that focus discussion on cross cultural connections and that may have implications for global educational settings. The subject matter scope will parallel that of JOLR – the theoretical, empirical, and pragmatic understanding of technologies and their impact on primary and secondary pedagogy and policy in primary and secondary (K-12) distance, online and blended environments. Indexed in leading indices including: Educational Research Abstracts, ERIC, LearnTechLib-The Learning and Technology Library, Index Copernicus, GetCited, Google Scholar, Journal Seek, Microsoft Academic Search, Bacon’s Media Directory, Cabell’s, Ulrich, and several others.